I received an email the other day from the people at Tilda, asking if I wanted to try their wholegrain basmati rice. And then a couple of days later, I received an email from a lady telling me all about kale. I've developed a bit of an obsession for kale lately, its frilly leaves shredded and added to stir-fries, smoothies or baked into crispy 'chips'. 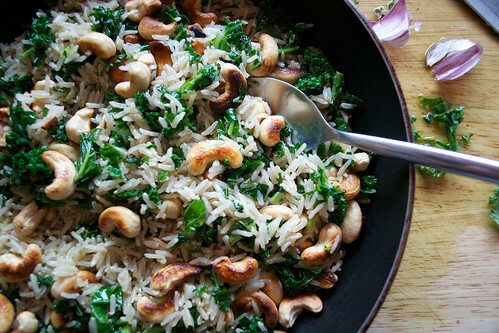 I decided to pair it with the nutty wholegrain basmati rice and crunchy golden cashew nuts in this dish. The grains of rice stay fluffy and don't stick together, making it perfect for a quick stir-fry like this one. It also makes a cheap, wholesome and stress-free dinner that's also full of fibre, protein and iron. You can't say fairer than that. Rinse the rice under the tap and then cook as per the packet instructions (in plenty of boiling water for about 25 minutes should do it). Once cooked, drain and rinse with cold water. Leave to one side. Next, drizzle the olive oil into a large frying pan that you can also fit the rice in later. Gently fry the cashew nuts until just sizzling and golden and then immediately remove to a waiting plate. Wipe out the pan, drizzle in another tablespoon of olive oil and then fry the garlic until softened. Add in the shredded kale and stir-fry for about 2 minutes, until the kale is dark, wilted and glossy. Tip in the cooked rice and stir well, finally adding the golden cashews. Season with salt and pepper and serve hot. This dish is suitable for the elimination diet, is vegan and therefore vegetarian too. For more information about kale, which is in season at the moment, visit the Discover Kale website. Tilda wholegrain basmati rice is produced with the outer bran layer of the grain intact, so it doesn't break up easily, making it perfect for stir-frying. Look out for it in the supermarket. Thanks for sharing this recipe with us i will try it Simple yet flavorful, love this method of cooking rice. This dish looks mighty scrumptious! My kind of food. just a good way to use leftover basmati rice... thanks!